One of the great things about Pattaya is that you have the ability to get around by walking most places or using the really good and really inexpensive public transportation system. 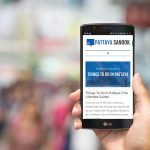 Most people find that Pattaya is a small enough city that they walk just about everywhere, especially if you are located in the center of the city. However there may be times when you don’t feel like walking, you don’t want to break a sweat before your night out, or perhaps you are going to the other side of town. Then it’s time to check out the variety of public transport Pattaya has to offer. Your options range from the open air and often times crowded Songthaew to motorbike taxis and a few options in between. 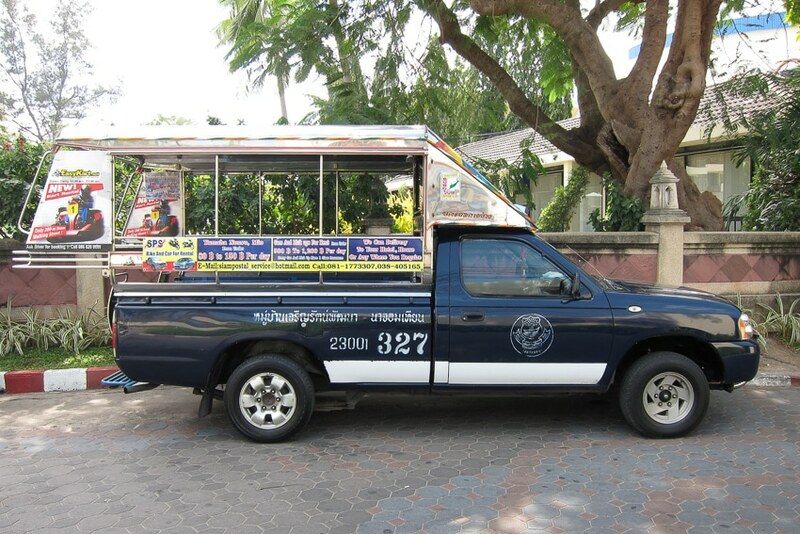 The songthaew (aka Baht Bus) are all over Pattaya and run pretty much 24/7. You will find the on the streets all over Pattaya, Jomtien and Naklua. You can even hire one for a private ride to where ever it is you want to go for an extra cost. Using the baht bus is really pretty simple. Stand on the side of the road and wave one down as they are approaching. Most of the time if they see you they will honk their horn first, then you just signal you are interested and they will slow down and stop for you. You just need to hop on the back and the bus will start going along its route again, stopping to pick up and drop off passengers along the way. When you are ready to get off, there are several buttons placed around the top of the bus. Press the button and a buzzer will ring signaling the driver to pull over. Get off, walk over to the window (whichever one is not making you stand in the middle of traffic) and hand the driver your money. The baht bus cost is 10 baht and it is best if you have exact change or something small like a 20baht note. Don’t expect a driver to break a 1000 baht note. The first of the main two baht bus routes in Pattaya is the large circle the stretches South along Beach Road from North Pattaya Road till Walking Street, then it continues up to Second Road which they’ll take all the way back till they reach North Pattaya Road and start the circle again. 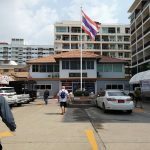 The second main route is on Soi Buakhao, where you can get a baht bus going in both directions from South Pattaya Road to North Pattaya Road. Though these are the main two runs that most people use, they are not the only ones. You can get a baht bus to direct to Jomtien at a stop at the corner of Second Road and South Pattaya Road. Also, as mentioned early in the article, you’ll find baht buses running all over town. You can just flag one going in the direction you want to go and stop them if they start heading in a direction you don’t want. The motorbike taxis are just as numerous in Pattaya as are the Songthaew. There seems to be a stand on every corner, which makes it quite convenient to use them. They also get you to your destination a lot quicker. Motorcycle Taxi prices will differ depending on where it is you want to go and a variety of other factors like the drivers mood. Most places you can get to for between 40 -80 baht as a starting point. Using a motorbike taxi is easy. Walkup to a stand, tell them where you want to go and ask how much. If the price is agreeable hop on the back, put on a helmet, and off you go. Note, a lot of the times they don’t offer you a helmet, I always ask for one. No need splitting your head open on vacation if it can be avoided. 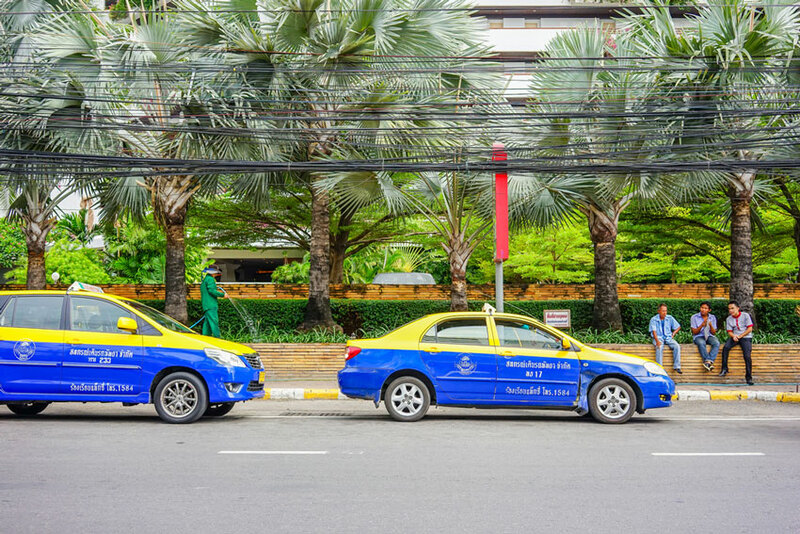 You’ll find regular taxis parked along the road throughout Pattaya. They aren’t as plentiful, which makes sense when you have so many other better options available for your transportation needs. You can usually find a line of taxis waiting for customers outside of the shopping malls like Central Festival and the Avenue Mall. 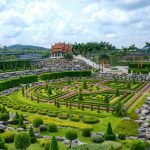 Prices are going to more expensive, and they will usually want to charge you a fixed rate as opposed to using the meter for going to places like Nong Nooch or the Sanctuary of Truth. If that is the case don’t be shy about trying to negotiate, and if the price still isn’t to your liking say thank you, smile and walk away. Then just keep trying different cabs to see if you can get your rate. It doesn’t always work and you might just end up paying the same amount the first guy wanted. If you wish to have your own mode of transportation you can rent motor scooter for either a day or your entire stay. You will find them for rent all over Pattaya. Many guesthouses and bars rent them out as well as small stands on the corner and other store fronts. A couple things to note. If they ask for your Passport, give them a copy not the original. You should never give up your Passport to a rental company unless it is just to make a copy. You will need to carry it with you while riding, and it’s just smart not to let anyone else ‘hold’ it for you. Next, make sure you have the proper driver’s license and an international permit. Get this squared away before you leave to avoid any unwanted hassles if you are stopped by the police. 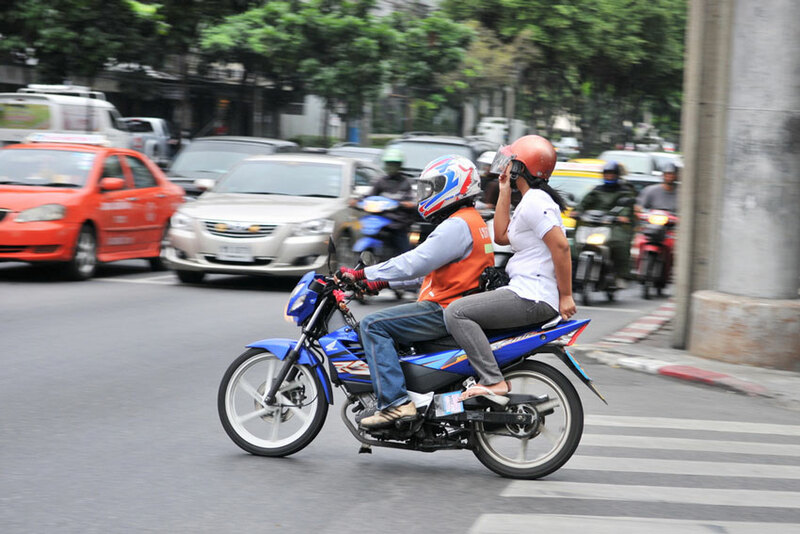 Also, make sure your insurance will cover you for any sort of medical or liability claim while you are in Thailand – specifically on a motor bike. Again, do this before you leave. If you are going to be keeping your bike through your trip make sure your hotel or guest house has a secured place to keep your bike overnight. If you have never ridden a motorcycle before, Pattaya is not the place to learn. Traffic is crazy and unpredictable and I would venture to guess there are more than a few drivers on the road who are under the influence. You can rent a car, but unless you are using it to make a day trip out of Pattaya there really is no need for one. In addition, there is so little parking spaces around the city that having a car there would be more hassle then it is worth. Image Credits: Hanoi photos/Shutterstock.com, Hanoi Photos/shutterstock.com.